The Honours of Scotland, also known as the Scottish regalia and the Scottish Crown Jewels, date from the fifteenth and sixteenth centuries, and as such are the oldest set of Crown Jewels in the British Isles. The existing set was used for the coronation of Scottish monarchs from 1543 to 1651; since then, they have been used to represent Royal Assent to parliamentary legislation. During the English Civil War, the Honours were hidden to prevent their destruction, and were retrieved after the monarchy was restored in 1660. The three elements of the Honours of Scotland - the Crown, the Sceptre, and the Sword of State - all appear upon the crest of the Royal coat of arms of Scotland, displayed by a lion. 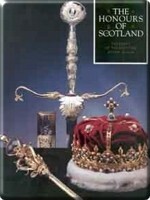 The Crown was refashioned from an original damaged version for King James V in 1540 by Edinburgh goldsmith John Mosman. The circlet of the base is made from Scottish gold, encrusted with twenty-two gemstones, twenty precious stones, and Scottish freshwater pearls taken from the original crown. The Crown's four golden half-arches are adorned with four gold fleur-de-lys and four red enamel strawberry leaves. A golden orb covered in gilt stars rests on the point at which the arches meet. Atop the orb stands a large cross decorated with gold and black enamel and featuring a large amethyst. The crown weighs 1,644 grams (or 3.8 pounds). The Crown in its present form was first worn by James V to the coronation of his second wife, Mary of Guise, as queen consort at Holyrood Abbey in Edinburgh, in the year of its manufacture. The last monarch to be coroneted with it was Charles II in 1651. The Sceptre was given as a gift from Pope Alexander VI to King James IV in 1494. Crafted of silver gilt, it is topped by a large crystal globe and a Scottish pearl. Many images adorn the Sceptre, including dolphins, a Madonna and Child, Saint James the Great, and Saint Andrew holding a saltire. The Sword of State was also a papal gift presented by Pope Julius II to James IV in 1507. The blade is engraved with figures of Saint Peter and Saint Paul, while the silver gilt handle bears oak leaves and acorns. It was damaged in 1652 while being hidden from Cromwell's New Model Army. Cromwell destroyed almost all of the English regalia during the Civil War. The Scottish Honours, however, were hidden in Dunnottar Castle. When that was later besieged by Cromwellian forces, the regalia were smuggled out and buried beneath the floor of Kinneff Parish Church until the monarch was restored. From the Union of the Crowns until the Union of Parliaments, the Honours were taken to sittings of Scottish Parliament to represent the monarch, who resided in England. After the Scottish and English Parliaments merged in 1707, the Honours were left without function, and subsequently locked away in Edinburgh Castle. There they remained, almost forgotten, for over a century until they were recovered by Sir Walter Scott in 1818. Afterwards, they were put on public display in the castle, where they have remained ever since with one exception: the Honours were hidden again in 1941 in fear that they might be lost in a German attack. They were retrieved in 1953 to be presented to the new monarch, Queen Elizabeth II, and were then returned to the display case in the Crown Room of Edinburgh Castle. The Stone of Destiny was placed beside the Honours when it was returned to Scotland in 1996. The Crown of Scotland has been present alongside the monarch at the opening ceremonies of each new session of the Scottish Parliament since its first sitting in May 1999. However, the Sword and Sceptre are now too delicate to be removed from their holdings for such occasions.